Reported significant improvement earlier this year in employment prospects for professionals in Australia’s exploration and mining industry has slowed, according to the latest Australian geoscientist employment survey results collected by the Australian Institute of Geoscientists for the quarter up to the end of June 2017. 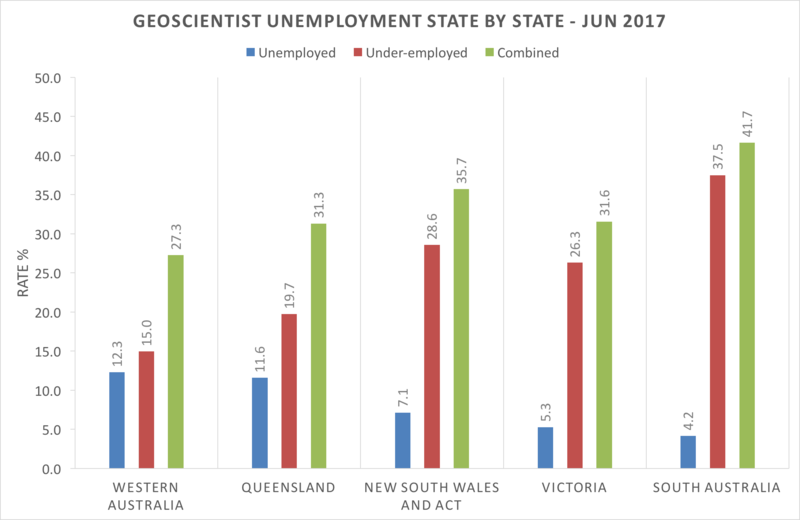 During the second quarter of 2017, geoscientist employment across Australia improved marginally ­­­compared to the previous quarter. 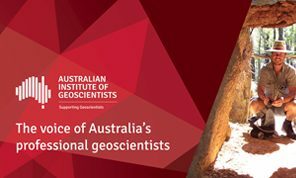 AIG’s latest survey indicates that the unemployment rate amongst Australia’s geoscientists, at 30 June 2017, was 11.3%. The corresponding underemployment rate was 19.0%. This represents a very welcome but small decrease in unemployment, down from 12.1% at the end of March 2017, offset by an increase in the underemployment rate, from 18.3% to 19.0%, during the quarter. Decreases in the unemployment rate are now evident in four of the past five surveys. Australia’s self-employed geoscientists, independent contractors and consultants, continue to face difficult times with only half able to secure one quarter of their desired workload. The employment situation varies markedly between industry sectors. The unemployment in mineral and energy resource exploration in this survey was 14.2%, compared to 6.9% in mineral and energy resource mining and production. The unemployment rate amongst geoscientists working in other fields, such as environmental geoscience, groundwater resource management, engineering geology, education and agriculture, was 4.0%. Unemployment and underemployment rates varied significantly between states. Unemployment was highest in Western Australia at 12.3%, the only State in which unemployment was observed to increase. South Australia recorded the lowest unemployment rate at 4.2% and the greatest improvement in the unemployment rate during the quarter. 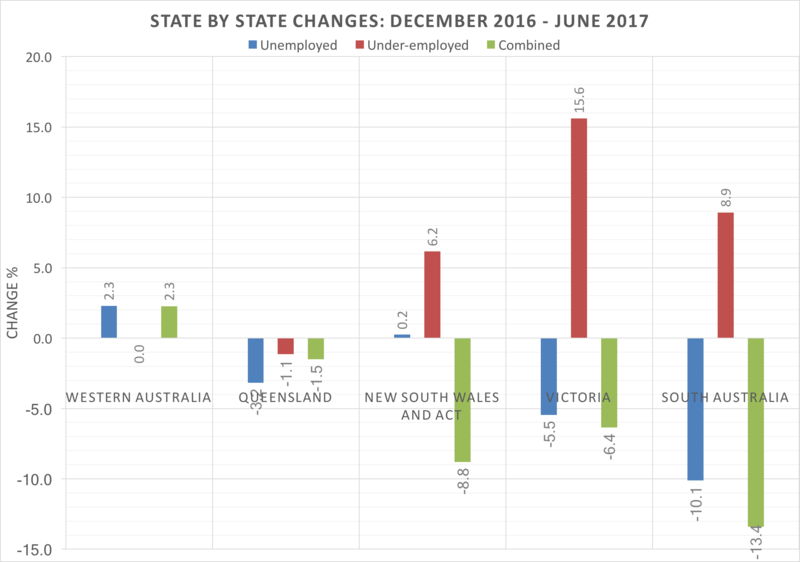 Underemployment was lowest in Western Australia, highest in South Australia and worsened in every State except Western Australia and Queensland. Long term unemployment decreased but remains a serious concern, with more than 60% of unemployed and underemployed not confident of returning to work within the next 12 months. 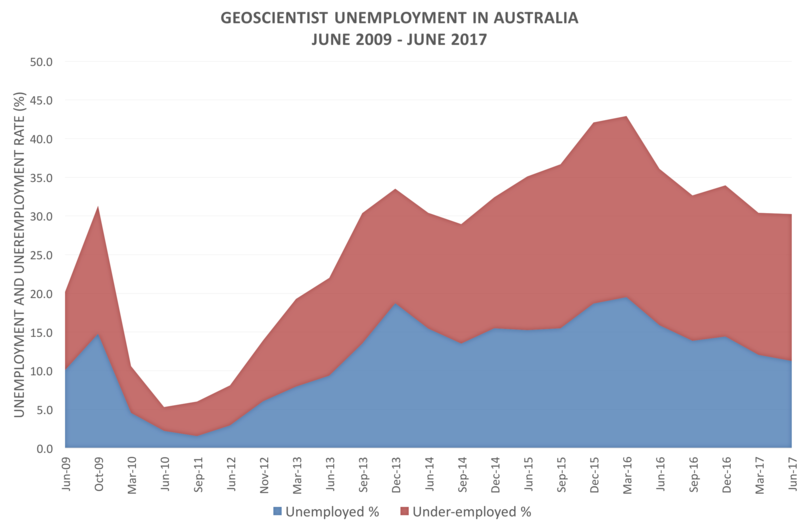 More than 13% of unemployed geoscientists regained employment during the quarter, but this was more than offset by geoscientists losing employment. 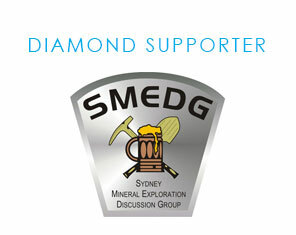 Sentiment amongst geoscientists in employment, however, improved, with more than half indicating that they were confident of remaining in employment for the next 12 months or more. Almost 20% of unemployed and underemployed geoscientists indicated that they were seeking to leave their profession, up 4% from the previous quarter, continuing an increasing trend. 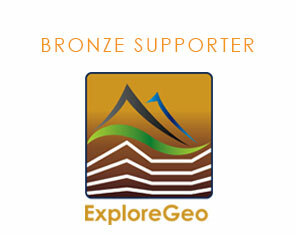 Some 61% of respondents indicated that they were working, or seeking work in mineral exploration. 14% were working or seeking work in metalliferous mining, and almost 8% of respondents were working or seeking work in energy resource exploration, mining and production. AIG spokesperson, Mr Andrew Waltho, expressed concerns regarding the slow recovery in employment opportunities for geoscientists in Australia, particularly in mineral exploration. “While our latest survey clearly shows that employment prospects for geoscientists are slowly improving generally, with four of the past five surveys recording a decrease in the unemployment rate, exploration activity remains low. “This has serious implications for the sustainability of Australia’s mining industry by threatening the strength of our mineral resource project pipeline. 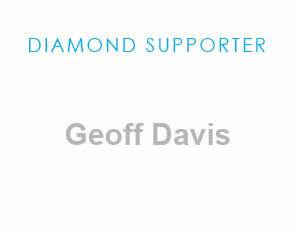 “Both greenfield and brownfield exploration is essential if discoveries are to be made to replace, let alone expand, the resource base on which miners produce essential minerals on which our society and economy relies” he said. 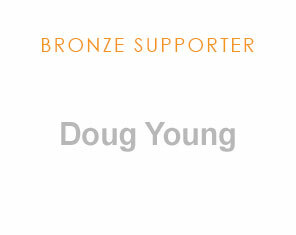 “There are some very positive signs in the latest survey results,” Mr Waltho said. “Unemployment is down, albeit slightly, and employment appears to be strong in the non-mining and resources fields, which represent a small but growing sector in Australian geoscience. “Employment opportunities in mining appear to be improving and while long term unemployment amongst Australian geoscientists remains high, the rate is falling. “It is also encouraging to see that higher rates of unemployment amongst geoscientists with more than 25 years of experience evident in past surveys have come back to levels closer to those for other experience bands. “The lack of employment opportunities in exploration, however, highlights a serious and growing problem of insufficient exploration being undertaken to sustain our resource industries,” Mr Waltho said­. “Geologists and geophysicists are, without doubt, continuously improving exploration technologies and becoming more productive, but this alone won’t make up for a lack of activity – the boots on ground search for new resources. 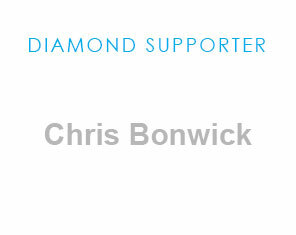 “Improving access to land, particularly for zero and very low impact exploration activities and addressing areas of sovereign risk that are increasingly being seen by investors as raising the risk profile of exploration, urgently need to be addressed,” Mr Waltho said. “Addressing these two issues throughout Australia has the potential to make an enormous difference in both employment and the future of Australia’s mining industry”.